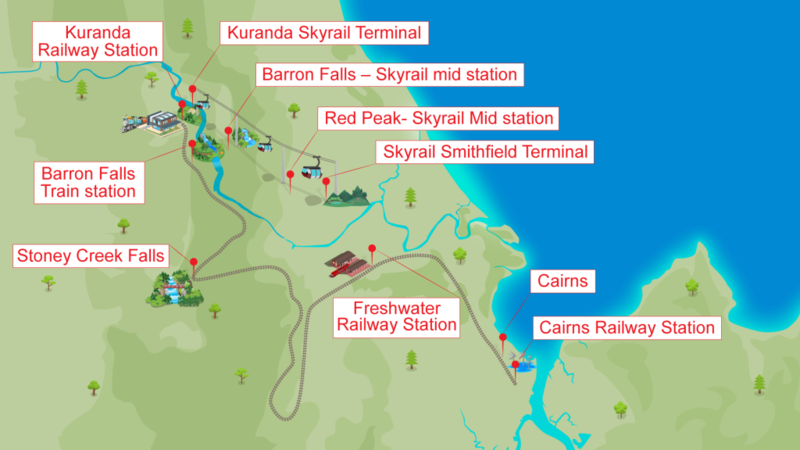 Kuranda, at the top of the Barron Gorge, has been linked to Cairns by a historic mountain railway since 1891 and Skyrail, a gondola cableway, since August 1995. The colourful "village in the rainforest" has a tradition of imaginative art and crafts including artifacts from local Aboriginal communities. Restaurants and food stalls are culturally diverse and plentiful. Other attractions include The Butterfly Sanctuary, Birdworld, The Aviary and the rainforest noctarium. Skyrail: Glide over the rainforest for a bird's eye view of the living canopy just below the 6 person gondola, enjoy the panoramic views of the coral coast and beyond to Green Island and the inner reefs. Kuranda Scenic Train;Winds through the Barron Gorge. The line passes through 15 hand carved tunnels, by waterfalls and breathtaking rainforest scenery. 2.5 hours minimum time to explore Kuranda and the markets. Accomodation transfers, one way Kuranda scenic train snd one way Skyrail cableway journeys. Complimentary pick-up and return from your Port Douglas holiday accomodation. Please contact us prior to departure using the details provided on your booking confirmation. You will be provided with the pick up time for your location.